Using Fix A Leak to seal pool, spa, swim-spa and fountain leaks. Pools, Spas, Swim Spas, Hot Tubs and Fountains!!! Scroll down to browse through information about Fix A Leak, the leak sealing product, which has been sealing pool, spa, swim spa and hot tub leaks, for more than 30 years. The Website Store Directory contains an alphabetized listing of all products for sale. We don't just sell products. We help you make a better-informed choice, by providing all the information, you might require. Need ordering help? Scroll down the page, for the Order Desk Telephone Help Number. All items ordered will end up in the same shopping cart, no matter on which page of this website, the items are located. These items can be ordered on-line, from askalanaquestion.com, with convenience and security. All Major Credit Cards and PayPal* are accepted. Order some today. Fix A Leak . . . the leak sealer!!! The Fix A Leak product is a patented composition, supplied in a concentrated form, and formulated to seal pool and spa leaks. It can be used with all types of materials, helping seal pool or spa leaks, present in the shell, walls, floor, fittings, skimmers or circulation system. Fix A Leak cures to form a long-lasting seal, that can eliminate leaks, as large as 1/8" (3 mm) in diameter. Gunite, fiberglass or vinyl pools should use 1-quart (954 ml.) for pools as large as 22,000 gallons (83,000 liters). Bigger pools should use proportionally larger quantities. Spas, swim spas or hot tubs should use 4-ounces (120 ml), for each 250 gallons (950 liters) of water. Leak detection services can help locate the leak, but the cost may be high and the repair may involve expensive excavation and damage to the area surrounding the pool or spa. Fix A Leak is not suggested for pool leaks losing more than 2-inches (5 cm or 50 mm) of water per day. However, for leaks losing less than this amount, Fix A Leak can be an easy and effective remedy. The product has been tested, under varying conditions and weather. Fix A Leak has demonstrated and confirmed its effectiveness, over the past 35 years, when used as directed. After the leak has been stopped, Fix A Leak cures to form a hard, long-lasting seal, in about 2-4 days. The directions for proper use are easy to understand and follow. Pool or Spa leak defects, that are bigger than 1/8" (3 mm), or pools that are losing in excess of 2" (5 cm or 50 mm) of water, on a daily basis, could have loss rates that are simply too excessive, for Fix A Leak to properly perform and cure. While, there is no way to be certain that Fix A Leak will posilutely and absotively seal all pool or spa leaks, it is certainly worth trying. Given its long history of success and the alternatives of high repair costs and perimeter damage, Fix A Leak can be a great cost saving pool or spa leak repair method. Larger units use proportionally more product. ● Proven leak sealing performance, for more than 35 years. ● Seals leaks in the walls, shell, floor and fittings, in Gunite, Fiberglass or Vinyl Pools or Spas, as well as wooden hot tubs. ● Each purchase includes expanded supplemental instructions. ● Can seal leaks without damaging the perimeter area. ● Performs well in circulation system leaks, including suction line leaks. ● Helps seal leaks as large as 1/8" (3 mm) in diameter. ● Proper use can provide a long lasting seal. ● Forms a water-tight repair, in 2-4 days, after a crust forms, which dries out and cures to make a long lasting seal. ● Pools use 1-Quart (954 ml) for EACH 22,000-Gallons (83,600 Liters or 83.6 Square Meters). ● Available in two sizes: 1-Quart (954 ml) for Pools or 8-Ounce (240 ml) for Spas or Hot Tubs. ● Available by the case, for professional use. ● Easy to understand expanded supplemental directions are supplied with every purchase made on our website. ● Will not damage pumps, filters, heaters, salt chlorine generators or other equipment. ● Bathing can be resumed, after the filter has been used to remove the excess Fix A Leak and the chemistry is optimized. 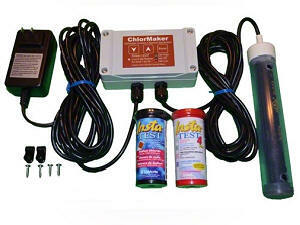 ● Safe for use salt chlorine generators. ● Helps avoid expensive repairs and excavation damage. ● For best results, the pool or spa water temperature should be at least 70°F (21°C). Not suggested for pools losing for than 2" (5 cm) per day. ● The Best Leak Sealing Specialty product since 1980. ● Settle for nothing less than the genuine article: Fix A Leak. General Directions for Using Fix A Leak. Fix A Leak is a heavy suspension and must be shaken thoroughly, before use. The filter must be bypassed, in order to prevent the Fix A Leak, from being filtered out. Set the multiport valve to recirculate. If this cannot be done, with a D.E. or cartridge filter, simply remove the D.E. Filter element or filter cartridge and allow the water to flow through the empty filter tank. Fix A Leak should be added to the skimmer, main drain or other water intake, while the pump is running, in recirculate mode. For suction leaks, characterized by an aerated return flow, refer to the directions below. Because Fix A Leak is so heavy, it will tend to sink to the floor, upon returning to the pool or spa. Set the water intake to close off the skimmers and use only the main drain. If there is no main drain, attach the pool vacuum to a skimmer and set in the deep end or center of the pool. Brush occasionally, about every 3-4 hours, while the pump is running, to help keep the product in suspension. Run the pump continuously, until there is an indication that the leaking has stopped. To monitor progress, make the water level with a piece of tape. Check daily for 2-4 days, while maintaining pump operation and occasional brushing. Some small water losses can be attributed to evaporation, so compare the losses before and after the Fix A Leak addition. Once the leak appears to have been stopped, make sure that you allow 2-4 days for the product to cure. Fix A Leak forms a crust, as it is carried out with the leaking water. This is what makes the seal. It has to completely dry out, to cure to a long-lasting seal. Normal filter operation can resume, after the leak has been determined to have been stopped. This leak-sealing crust forms on the outside of the pool, spa shell or pipes. Draining of the pool or spa is not necessary. The excess Fix A Leak will be removed, with the resumption of normal filtration and the vacuuming and/or brushing of the pool or spa floor. Return the multiport valve to the filtering position and resume filtration. Backwash daily for the next 2-3 days, while brushing the floor. Cartridge filters should be cleaned daily, for the next 2-3 days, while brushing the floor occasionally. Never allow the wet cartridge dry out, without a complete cleaning rinse, D.E. filters resume normal operation, brush or vacuum the pool floor and clean the filter out in 2-3 days or if the pressure rises too high. Don't allow the filter grids to dry out, before completely rinsing free of the removed excess Fix A Leak. You MAY repeat this treatment, as might be necessary. Using Fix A Leak for Suction Line Leaks. An aerated return flow is usually an indication of a suction line leak. Some minor amounts of air bubbles are normal and are not a positive indication of a suction line leak. This type of leak, in most cases, only loses water while the pump is NOT running. Maintaining normal water flow will cause air to get sucked in, preventing the Fix A Leak from reaching the site of the leak. Therefore. the flow of the water must be reversed, so that the Fix A Leak product can be carried to the leak and start forming a crust, as it seeps out. Keep the pump pressure at 5-10 PSI, until the leak appears to have been stopped. During this treatment, brush the floor, to help keep the Fix A Leak in suspension. IMPORTANT. After a suction line leak has been sealed, DO NOT restore normal water circulation, for at least 2-4 days. This will allow the Fix A Leak crust to dry out and cure to form a long-lasting seal. Miscellaneous Pool or Spa Leaks. Have you considered possibility of a leak around any of the fittings inside pool, such as return-jets or hydrotherapy jet fittings, installed underwater lights, pool skimmers or the rubber gaskets used around some types of steps? You can try applying the Fix A Leak product directly to the potential leak, by filling a dispensing bottle, such as those used for mustard or ketchup. Stop pump operation. First, using a concentrated leak detection dye, might help locate the location of the problem, by visibly being carried along to the leak. Pool leaks. resulting from cracked pipes or loose connections can be subjected to vibration or pressure expansion and may not able to be sealed, on a permanent basis. Some pool or spa leaks, because of their location, size or loss rates, may require the repair efforts of a skilled professional. Spa, Swim Spa or Hot Tub Leaks. Remove the filter cartridge, which will effectively be the same as bypassing the filter. Shake the Fix A Leak very well, to help restore its suspension. The Fix A Leak product is very concentrated and heavy. It will quickly sink to the spa floor, unless stirred up with a broom, in addition to maintaining circulation. 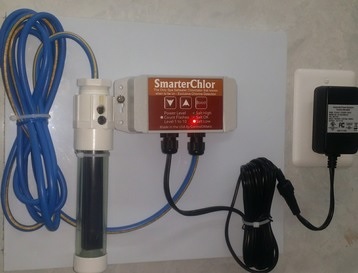 The product should be slowly added to the skimmer or other type of water intake. Recirculate and brush the spa floor, until it appears that the leaking has stopped. After the leaking has stopped, allow 2-4 days, for the product to dry out and cure. If there are signs of wet insulation, it should be removed, to facilitate the drying out and curing process. At this point, either drain and thoroughly clean the spa, with a wet, non-abrasive towel or resume filtration. If choosing the latter, brush the spa floor and hose-clean the spa filter cartridge a few times, over the next several days. Never allow a filter cartridge, that has been used to remove the excess Fix A Leak, to dry out, before thoroughly cleaning and hosing off. Allow the underside to dry out for 3-5 days. Open the cabinet and use a fan to ventilate the underside, to help with the drying out and curing. Fix A Leak Application Rates. Under The Same Leak Conditions FIX A LEAK Will Outperform The Rest! This product could save you hundreds or even thousands of dollars! This is the genuine article!!! Helpful Hints and Supplemental Instructions Are Included! Why not purchase this product, from someone, that actually knows how it should be used? We have been helping people use the product, for more than 15 years! Unsure of your pool's or spa's volume? Click Here For Some Additional Fix A Leak Directions. Click Here To Read Some Fix A Leak Feedback. Fix A Leak Pool Questions and Answers. Fix A Leak Spa-Hot Tub Questions and Answers. Click Here To Read Some Geo-Thermal Application Information. Scroll down to view the product choices and to place an order. We realize that you want the product as soon as possible! and try to get it you, within 2-3 business days, after shipping. * Extra Savings on U.S. Orders Only: Ship multiple bottles of product, for one low handling charge of $9.99, on orders up to $74.99. Orders of more than $75.00 ship free of charge, with no handling fee. Place order above. Shipping charges will be calculated and added to the order, based on quantity and destination. Some Orders, for more than 6 bottles of the 1-Quart Size, shipped Outside Of The Continental U.S. (48 states) May Require Additional Shipping Charges. Shipments are made via Priority Mail International, with an expected delivery of 7-10 days, after shipment. You reserve the right to cancel and receive a full refund, should you decline to proceed with the shipment. The text on this page, relative to the Fix A Leak product and its use, is original work product and is the intellectual property of the website's owner. It may not be used, in whole or part, by any party, without the consent of this website's owner, or it will be in violation of the Digital Millennium Copyright Act (DMCA). Mobile Lab for the ultimate in portable Pool and Spa testing.